AMD has presented a new roadmap at the annual Financial Analyst Day which details the new hardware the company would be launching through 2012-2013. 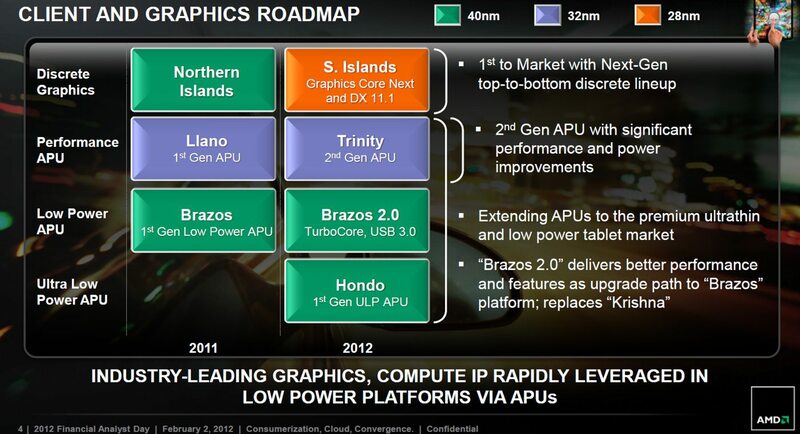 The 2012-2013 Roadmap shows that AMD is focusing alot on its APU lineup which includes the Trinity (A-Series), Brazos (C and E Series) and the Hondo (Z-Series) Accelerated Processing units along with the 2nd Generation FX Processors lineup codenamed “Vishera” featuring the Piledriver core and the new 28nm DX11.1 Sea Island graphics processing units. Trinity which is the successor to the Fusion Llano APU would be based on the 32nm process, Featuring DX11 “Graphics Next Core”, 2-4 Piledriver Cores which are expected to offer 25% performance increase over the stars core in Llano, Improved HSA enhancements and power draw as low as 17W. The Trinity A-Series APU’s are expected to launch in Q2 2012. Other two APU’s Brazos 2.0 and Hondo would feature the 40nm Bobcat Core and 2nd Generation DX11 GPU. TDP ranges from 4.5W on Hondo to 9-18W on Brazos 2.0. Both APU’s are specifically designed for low power/low cost mobile and desktop parts. 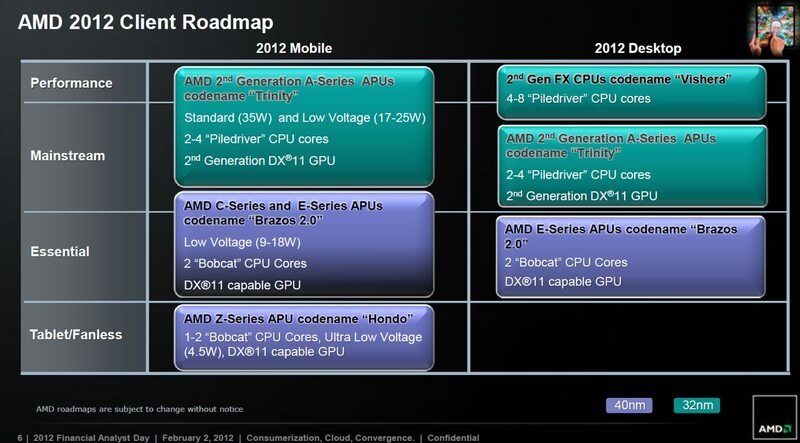 AMD also plans to launch its 2nd Generation FX Processor lineup codenamed “Vishera” in Q3/Q4 of 2012. 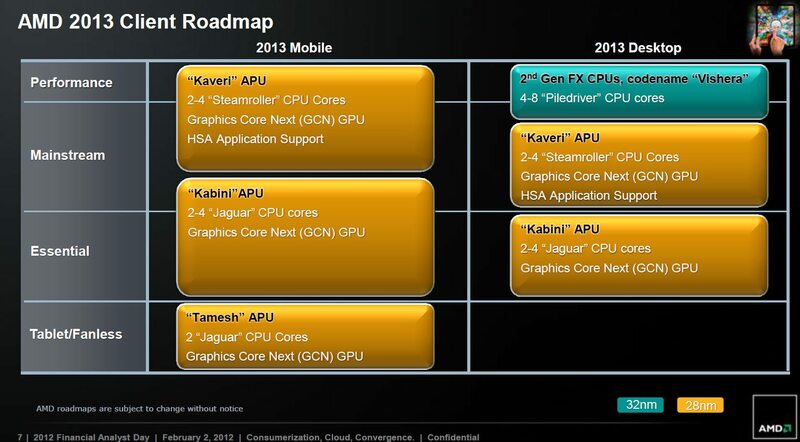 The new FX processors would be available in 4/6/8 Piledriver core models. More on Vishera aka Piledriver here. 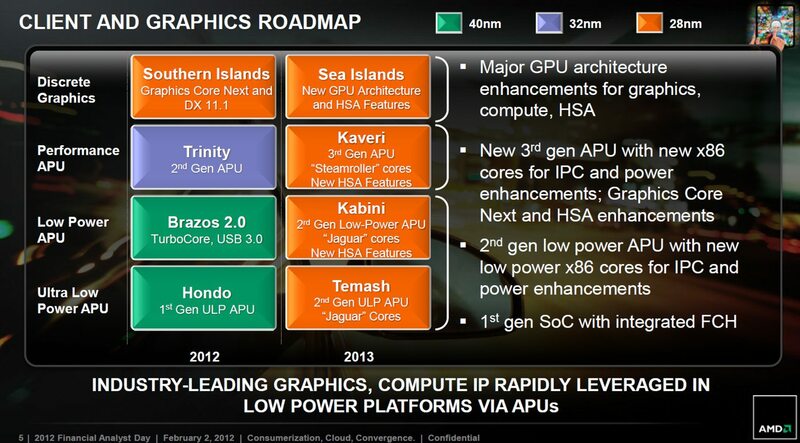 During 2013, AMD would launch its next generation Sea Island GPU’s featuring DX11.1 graphics. Sea Islands would offer Major GPU architecture enhancements for graphics, compute and HSA. Finally in 2013, We would see the launch of three new 28nm based APU’s, Kaveri which would feature 2-4 Steamroller cores and DX11.1 GCN GPU and the Kabini/Temash 28nm low power and cost effective parts based on x86 Jaguar Cores.